Laytown races occupies a unique position in the Irish racing calendar as it is the only race event run on a beach under the Rules of Racing. Many generations of people from the Meath area and the bordering countries have fond memories of their visit to the strand at Laytown and of the colour and the excitement of race day. Laytown strand races have been in existence for one hundred and forty years. 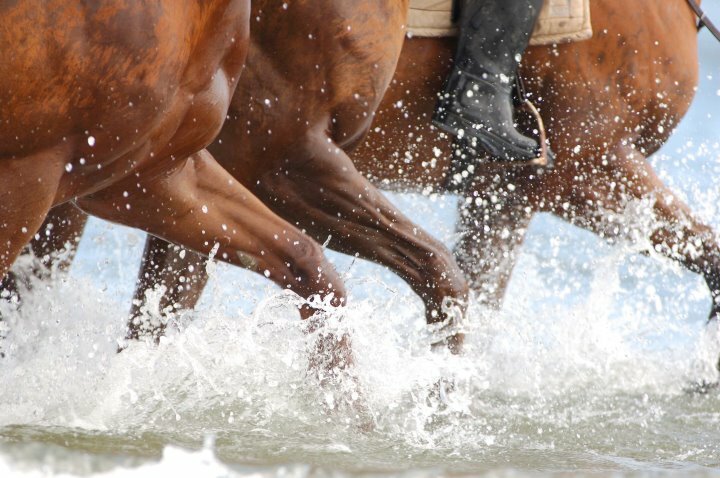 The first recorded meeting was in 1868 when races were run on the beach in conjunction with the Boyne Regatta. It is assumed that the rowing competition took place on the high tide and the racing when the tide receded. Initially the races were a side show to the regatta and were only organised when the combination of high and low tides allowed the racing on the beach at the conclusion of the rowing events. Charles Stuart Parnell, the great Home Rule leader, was one of the first stewards of the strand races. In 1901 the local Parish Priest became involved in the organisation and despite the disapproval of the Bishop of Meath the races became a well organised event. In those days strand races were quiet common being run in places throughout Ireland such as Milltown Malbay in Co Clare and nearer home at Baltray and Termonfeckin. The racing continued throughout the years and in the nineteen fifties and sixties Laytown was considered an important meeting for horses preparing for the great Galway Festival. In those days there were no all weather surfaces for training horses and the sands at Laytown were considered ideal preparation for the Galway track. The Laytown meeting was an important cultural event in the Meath calendar. Racing was run at distances between five furlongs and two miles with a U-shaped turn at Bettystown where the horses made a colourful sweeping return before heading back to the Laytown finish. The whole beach area was a profusion of colour with racegoers, bookies, fast food outlets, ice cream vendors, hurdy gurdies, roulette tables all sharing the strand. In the midst of all of these the tree and card-trick merchants appeared, disappeared and reappeared, constantly on the look-out for the gardai. An unfortunate accident in 1994 served as a timely reminder of the necessity of new safety measures. The U-shaped track was done away with and the Turf Club imposed restrictions on the number of runners in each race and also insisted that only experienced riders were allowed. From that date vehicles were prohibited from the beach as were all betting facilities. The organisation of Laytown Strand Races is a huge undertaking. The committee has a lease of a three acre field in Laytown known locally for generations as “the race field”. It is a wonderful elevated site above the beach and beside the finish line and racegoers have a fine view of the races from this natural vantage point. Laytown as a racetrack doesn’t exist. The only permanent building on the course is the Gents! For several weeks before racing the beach is continually checked by senior members of the committee to determine the most suitable “bank” for racing on the day and as all beaches are dynamic and constantly changing this requires a skilled eye, achieved over many years experience. On the run up to the day the race field is transformed from a green site to a racing enclosure, with parade ring, bookies pitches, judge’s box and temporary grand-strand erected. Marquees spring up to house the bar, restaurants, weigh rooms ambulance room and secretary’s office. During the past few years attendance, now contained in the race field, has been in the region of 5,000. This is a far cry from the halcyon days of the early 1990’s when crowds of 10000 were common. Many celebrities have been spotted over the years. In 1950 the Aga Khan, one of the sport’s legendary owners and his wife the Begum were in attendance. Many leading trainers support Laytown including Dermot Weld, Kevin Prendergast, Mick O’Toole, Tommy Stack and Michael Cunningham Local families have an association with this event that can be traced back several generations. The present chairman Niall Delany and his brother Eamonn are third generation supporters of this event. The Hoeys, the Crinions and the Lyons are all represented on the 2011 committee and in the past previous members of these families were actively involved. Itâ€™s not Royal Ascot. Itâ€™s not Glorious Goodwood but Laytown Strand Races is part of the life of this east Meath area for many years. It is a surviving feature of a culture fast disappearing from these islands and it is as much a part of our heritage as Puck Fair and the Rose of Tralee. People travel from far and wide, including many annual overseas visitors, to see this unique event on the beach at Laytown. That word unique is bandied around a lot by promoters of events that have spurious claims to such worthiness but this spectacle is worthy of the moniker because it's the only offically approved beach racing in Europe. Crowds as large as 11,000 turn up to see it every year. The last time that many people were on a beach in Ireland was when the native Irish were trying to drive back the hordes of invading vikings in the middle ages. The enclosures at Laytown consist of a three acre field elevated above the beach and the grandstand is hewn from steps cut into the sand dunes. Marquees are erected to use as weighing room, jockeys' room and bars etc. The course itself is a section of the 3 mile long golden strand, which is closed on the morning of the races, which take place when the tide goes out. Racing takes place on the Laytown stand on a straight near-level course over six and seven furlong distances. 46 km north of Dublin, turn off the Dublin-Belfast road (M1) Junction 7 at Julianstown. There are regular train services from Drogheda and Dublin (Connolly Station) to Laytown Station. There is a special bus service from Drogheda. Dublin is the nearest airport.